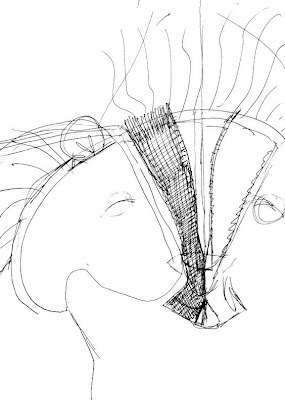 Everybody designs in a different way - for me, I use LOTS of paper - and start out sketchy. Then the geometry comes in - I might even get out a ruler and compass, but that is rare. I like the 'organic' human-made look and drafting can sometimes ruin that. I start making mental origami out of the paper before scissors ever touch cloth. A lot gets worked out in the paper - but still things go through several stages. Sewing up a prototype pattern (a muslin, if it was a garment) isn't always as easy or as smooth as you thought it would be. Things get ripped out - pieces saved and others recut etc. etc... and hopefully by the end of the day (or two) you have a brand new, designed-by-you toy pattern with most of the major kinks worked out. 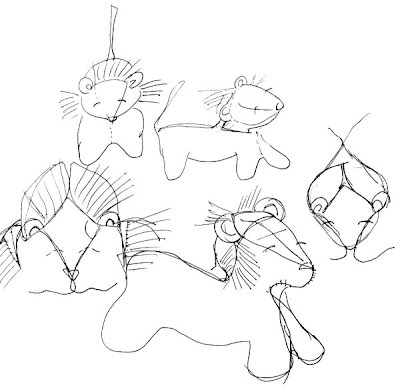 Hopefully you'll meet a cloth version of this lion soon! 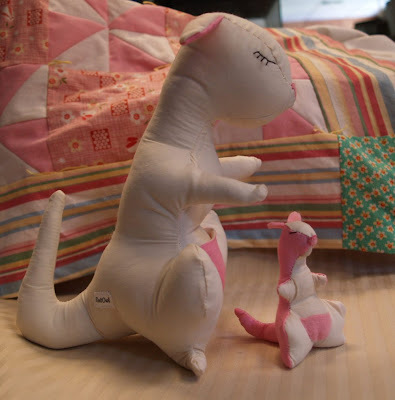 Last year I made a custom pink kangaroo and baby for a lady in New York. I lost the pattern in January, so tried reworking it this week. I'm still tweaking patterns for the pamphlet we hope to print, but it's quickly turning into a real book-length! 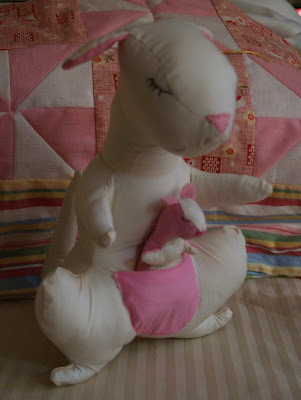 I made this Mama Kangaroo mostly on the sewing machine and the baby is entirely handsewn. 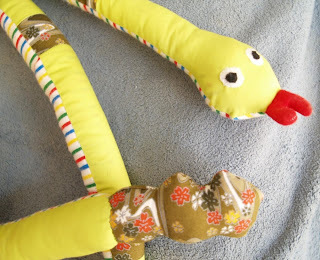 I also finished the second pair of bassinet bumpers for Bazooka (this post is just full of tongue-twisters, isn't it?) 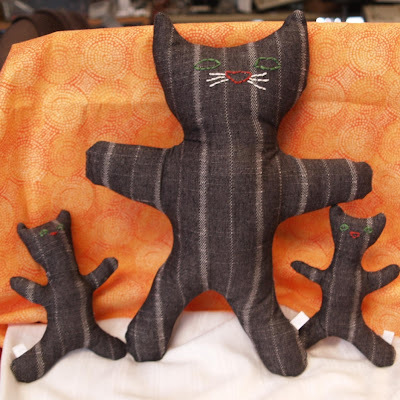 and have been working on a few more black cats that aren't quite ready. 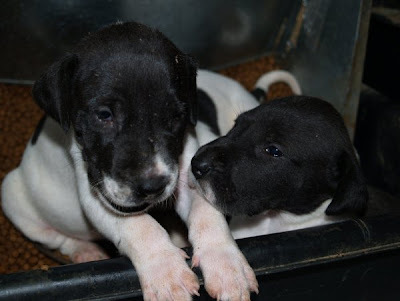 The puppies are at ankle-biting size and are now quick on their feet. 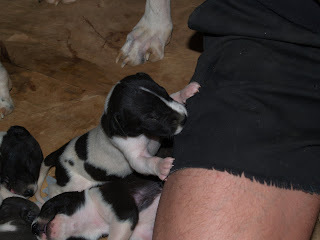 We send them outside for most of the day with Mom and gather them back up at night. Sending good wishes to Chris and Susan on their upcoming surgeries! Also, thank yous to Lynn and Jennifer for sharing some of their labor and delivery stories with me via email. Mama is 8 inches tall and baby is 3 inches tall. We're already reserved for someone! 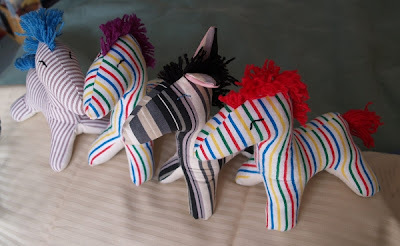 -Ask about custom toy orders from KnitOwl! Most of the information they gave us at the class was also available at this website. Yesterday was the childbirth seminar - it lasted from 8 am to about 3 pm, which was very long! It wiped me out. When I got home I napped for several hours then spent most of the night trying to get rid of a sinus headache. They said most babies tend to fall asleep soon after delivery. If I plan to breastfeed it should be done as soon as possible - while the baby is still alert. They reccommended that I attempt to feed her first, then invite visitors to come in and see her afterwards, or when she is getting sleepy. The room has a shower, which I can use up until a certain dilation - and several chairs and couches near the bed. They said as long as it seems safe for the baby I can get up and move around wherever they can make the monitor reach. My doctor had made it sound like as soon as I got into the room I'd be confined to the bed, and not be allowed to get up again until the baby was delivered. That was not a nice thing to hear! If there are good reasons not to get up it's one thing, but he made it sound like standard practice. The nurses said they rarely call the doctor into the room until a certain amount of dilation or if there is trouble with the baby, so maybe he is just giving info about what happens after he arrives? I've been feeling increasingly uncomfortable walking at random times, especially when there is lots of up-and-down (stairs / hill etc.) Someone on my email group said this feeling, which is like being hit with a bicycle seat on a bump just hard enough to be unpleasaant, is most likely a foot, elbow or shoulder etc... (small non-smooth part) bouncing against my cervix. This is more likely because Bazooka is in there sideways. If her head or back was facing down the pressure would be dispersed over a larger area. A small part against there makes a more 'pointy' feeling, that if you're sensitive enough, could be uncomfortable. The heavier the baby gets the worse it might feel - especially on quick or swaying movements. It makes me feel better to know it isn't a bad sign - but quite unsettling anyways! 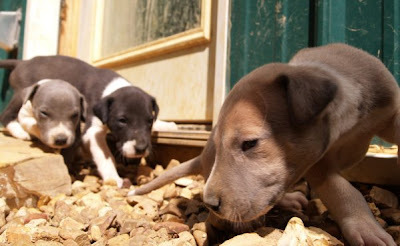 The puppies got their first excursion outside. 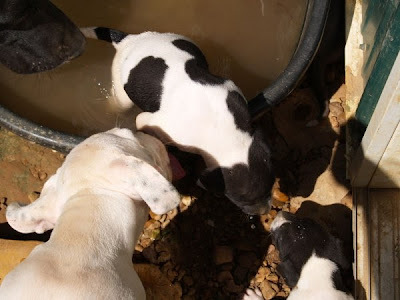 This is outside the back door where there is an auto-refilling water dish which Pixie loves to splash and play in (hence the mud all over the wall, door and in the dish) We dump it out on a regular basis and let it refill with clean water. Gray Girl, Silver and a sibling crawl about like lizards. 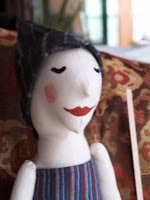 I really, really like this lady's style: Cottonmonster. And the toys are HUGE! Makes me want to work on my dragon again, which would be much bigger than most of the toys I spend time on now. 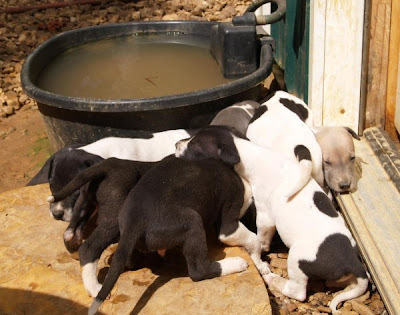 Dee Dee's Great Dane puppies are mobile now, and they have lots of little sharp teeth. 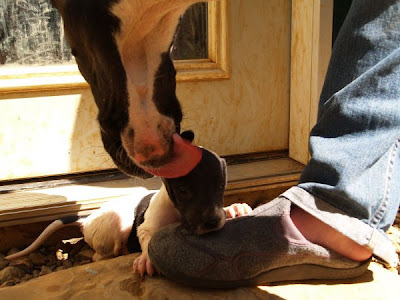 That means they're eating some puppy food now - but also that Mama Dog is avoiding them a lot! This morning they were all pooled at the bottom of the staircase hollering and yipping at the top of their lungs. Of course, Mom was sitting a few stairs up, trying to find somewhere to hide. Sadly for her even at this young age they can climb a couple of stairs -- it won't be long that she can hide at the top of the stairs from all those little mobile puppy teeth machines! 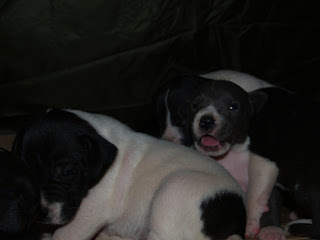 A few of them have names now - there are the two 'grey' (merle) ones, which are Silver (boy) and just 'Gray Girl.' There is also Butterfly (poor boy, what a butch name, huh?) and Mark named the loudest black-backed one of them all 'Squeaker.' 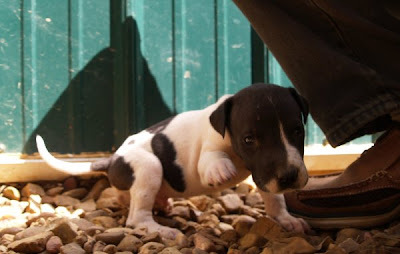 He has been vocal, barking and growling, right from the start. I'm thinking of calling one of them 'Goofy' because he has a really funny way of walking right now. We're 33 weeks (out of 36 to 40 full-term) We went to the doctor yesterday and he said Bazooka probably weighs 4 to 5 lbs now and is still lying transverse (sideways). There's plenty of time for her to shift around and get into position. I'm starting to feel her weight more when I walk - like a ball bouncing up and down, especially downhill or downstairs. A lady at the flea market said I'm carrying her 'really high', but I can feel her movement all over at different times - with her head definitely to the right-hand side. She has been consistently active -- squirming around and turning back and forth, lots of finger-movements on one side and rapid beating kicks on the other. She has surprised us a couple of time with very large movements visible from the outside. Yet, hardly any of these feel anything but 'funny' - no pain unless she presses her head/back up against my ribs. That will probably change as she gets even more constricted over the next few weeks ;) I still have to keep my ankles up quite a bit of the time, and having to sit there still makes me restless and wanting to do other things. Only my boots or slippers fit me now :( and even those I want off as soon as possible. In other news: Mark's mother seems to be doing much better after her surgery! I was up there a bit today talking with her. 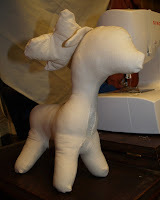 Also working on re-drawing my kangaroo pattern for the pattern pamphlet. There might be a new prototype to show off in a day or so. Thanks to our parents and some of you as well we have most of our list! Thank you again! There's just a few things left for us to pick up and knowing more about breastfeeding/bottle-feeding should get us up to 'ready.' The class on this Saturday will make me more confident to know if we have thought of everything. 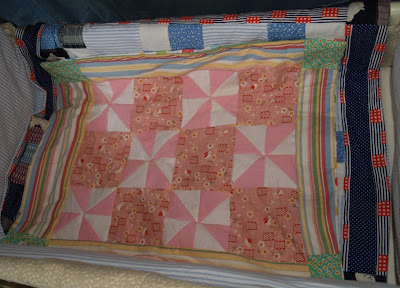 I have to make more little quilts and bumpers as I know they will need to be washed often (and they are quick to make - I've just been making other things). 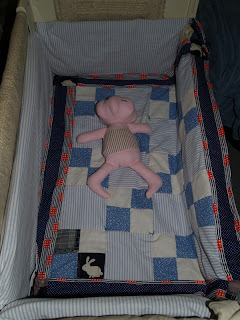 One of the things 'left' on the list is the changing table, but I'm reluctant to buy an expensive one because when I helped my sister take care of her baby (many years ago) we always used a bed, the crib, the kitchen table, couch etc... and there wasn't a changing table anywhere in the house. We might still need to buy a cheap one to go downstairs in our bathroom, as there isn't a good flat surface of adequate height there, but upstairs we have plenty of places, especially the bassinet (it's designed for that) to set her down and have clothes and diapers within easy reach. There are lots of new toys in the shop this week! There are also some new paper goods and vintage items! are black cats for Halloween! These little stuffed rabbits are ready to hop! 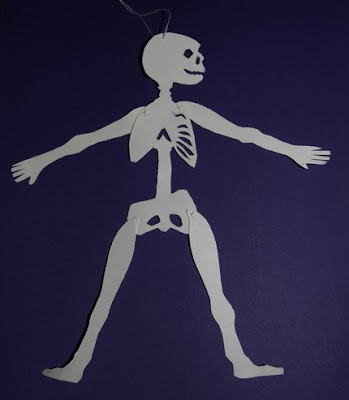 A fun skeleton paper doll. I know it's weird, and the last thing I should be thinking of right now - with Bazooka coming in a month - but sometimes I still feel like I failed Salamander and Willowpede. Sometimes I still dream that they are 'talking' to me in their way, just slight moments that actually stir me from sleep... and I know that sounds weird... Usually I just think it's one of our girls here, Mouse or Pogo, transferring into older memories. 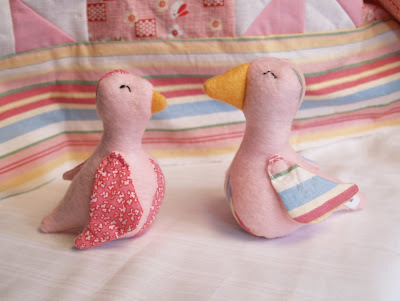 I'm working on making my toy patterns more suitable for the sewing machine. A few months ago I was contacted for a book inclusion and even though that lady hasn't talked to me since then it is still a very good idea. We might even see about just making our own little 'booklet' with the local printing place - of about 8 to 10 patterns with instructions. My mom used to collect scraps of everything she thought was useful. There was the bag of fabric scraps, for quilts that never got made (until I started sewing). There was the bag of 'left socks' that never got matched up. There was the box of paper and ribbon scraps, for making cards. There was a huge box of pennies, that got cashed in once a year. There were meat and grease scraps for making weekly stew and gravies.. (which did get used). Leftovers from the fridge were thrown together into hotdishes every couple of days. I was always taught to keep the scraps just in case they make up to something. My mom said it was the 'Dutch in us' (not sure where she got that from) - the kind of attitude where you lick the bowl and spoon after mixing a cake. Often her scrap-saving ways would pay off, but just as often there would be mass-cleaning days, which were very stressful, where Mom wanted to 'get rid of everything.' I get some of that from her too - and it's a good explanation of why I clean when I'm stressed. I haven't been doing as much of that since I've been with Mark, cleaning while stressed that is - I do clean, just not in that hurried 'I'm worried about everything - everything must be clean to make it better' sort of way. I always hated that habit, even AS I was doing it. For a while there, knitting was that kind of habit as well. I would churn out a dishcloth every day - or more, and it was a way of defocusing on what was upsetting me and making the stress into something productive. I don't knit as much as I used to either - but I do sew. Sewing isn't quite the same - it is like drawing, productive and ever-changing, keeping my focus on the project - not letting my hands go over the same repetitions over and over while my mind goes blank. Not to say I'm giving up knitting - but yes, it has taken a back seat to my sewing simply because of this natural tendency. Yesterday I took a good hard look at my fabric scraps. I'm always moving so quickly from project to project - it's hard to realize how fast they accumulate. They pile up in corners, and in bags - and soon you're wondering 'What in the world am I going to do with this?' 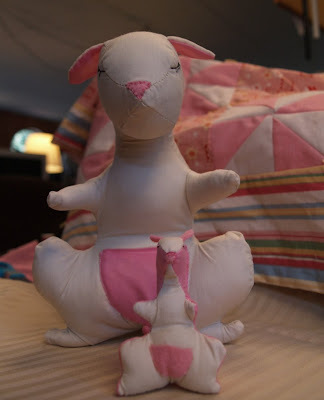 I've made a few of the bassinet quilts out of scraps from the stuffed animals - and started throwing all the smallest pieces away. I guess I'm not so very frugal as my mom - but my workspace looks a lot cleaner! Thank You Susan! Getting organized for Bazooka. Mark's mom is in the hospital for appendix surgery - we are hoping this will all go smoothly and she'll be feeling better quickly! Update: She came through the surgery okay, although it was more severe than they had thought... please keep her in your thoughts as she recovers. 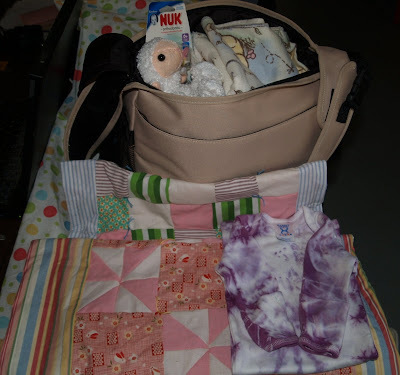 Susan at Knitiot Savant sent a huge box full of things from her little girl for baby Bazooka! There was just so much - Thank You Susan! 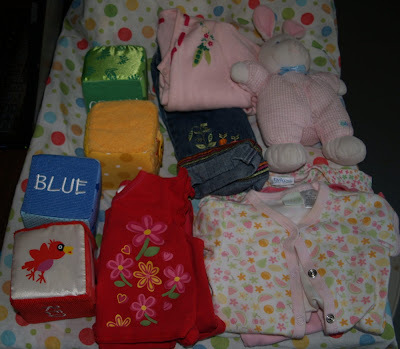 I've only taken a fraction of it for a picture here - but she included lots and LOTS of baby clothes, blankets, a baby bath robe, baby toys including the fun blocks and bunny rattle below, and her breast pump as well. Our birthing class is on Sep 22nd, and I hope to learn more about the breast pump there. This is just a tiny fraction! Jeans, toys, onesies, sleepers, sweaters and outfits of so many cute designs! Susan's box also set me 'nesting' again - taking out and sorting everything in my two containers by size and putting all the bath and feeding items in one place. I'd been putting it in just 'as gotten' - and it wasn't very organized. There was also a lot still sitting on a high shelf which I brought down into easy reach for later. Then I started packing the hospital bag - and that really makes me feel like this is going to happen soon (we have about 6 weeks to go). Thinking about what we are going to need for that first day really hits home! I have enough batting for a pink set of bumpers too. 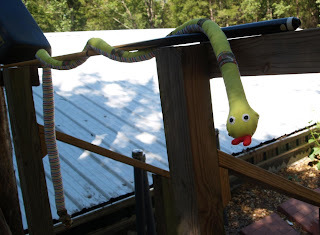 Made another snake for us to keep - and although this shot is blurry Pogo is giving it the raspberry right back ;) It was so funny to watch! Mark had a great idea for a 'huge' toy for the shop. This friendly 'rattle' snake is 80" long, nearly seven feet! 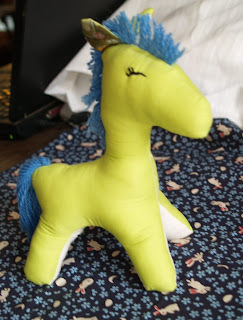 He also has a small rattle-box sewn into his tail. Stuffing him was quite a challenge! Much better than scary copperheads, eh? 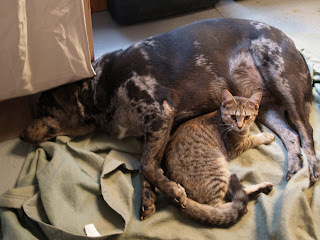 Mouse and I are going to have quite the battle over the bassinet. She says we're not using it yet, so why can't she? I've kicked her out of it four times just yesterday and today she snuck back in and was comfortably curled up when I tossed her out again. *sigh* stubborn Manx cat! At eight months, we're on 'every two weeks' with the doctor so we go again next Wednesday. I'm curious to have the doctor estimate how Bazooka is sitting inside me next time. A kick or two a day is starting to be strong enough to make me say 'Whoa little girl, calm down! ', but of course I don't mean it. I like to feel her kick and wiggle to know she is there. My back muscles and leg joints are finally starting to complain about the extra weight, epsecially at night, and I'm feeling a definite downward pressure on my pelvic bone at times. I'd heard about 'pelvic pressure' as the baby gets larger but didn't understand what they meant until it actually started happening. 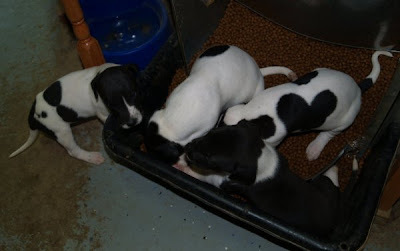 Most of the puppies have their eyes open now and they are between crawling and walking. 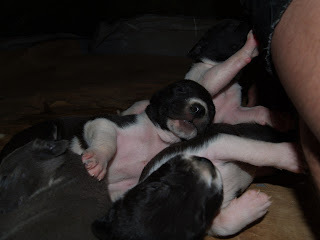 We took a few more pictures of them scrambling around. We set up the bassinet yesterday, and today I worked on making the bumpers. We also hit a few yard sales a town over. It was pretty easy to snap all the joints into place, and then discover how one side comes down to allow access from the bed. 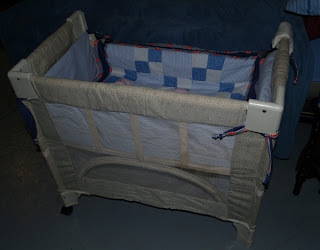 This is a 'co-sleeper' bassinet, which allows mom to have the baby right next to the bed in the middle of the night in a safe place 'in arm's reach.' It should work for Bazooka until she is 4 or 5 months old. The really nice thing about this kind of sleeping arrangement is mom doesn't have to get up and go across the room for breastfeeding. Well, I might not be ready for Christmas to come yet, but I can get a few things ready for Halloween. The bassinet came in the mail today, such a big package! We haven't put it together yet. There will be pictures. I've also started washing things and hope to slowly get through the pile we've accumulated. I'm starting to feel much more 'whoa, slow down' from my body lately. I get up and start to move and then suddenly I have to change my plans about how fast and how vigorous I can be at whatever task is at hand. I'm holding on to my stomach more, as well - as if there is more there that needs to be supported in all those twists and turns ;) The one foot that swelled last month or so is keeping up the habit, and I'm having a really hard time keeping it elevated, as that means staying in one place for long periods of time, not really my forte! It's just one day after Labor Day and it seems people are already thinking about the holiday season. I saw lots of Halloween stuff being sold, and when I checked my mail today I found an inquiry about making some toys for a Christmas showcase. Christmas toys already? Well, I'm ready as soon as she tells me the quantity and color. In that same vein, I started gearing up for more production by buying some new fabrics and a new iron. I was using Mark's mom's old iron but it was time for a new one. 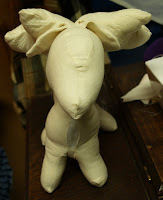 Mark also had the idea that I could make little reindeer with some alterations to the horse pattern. I tried the first prototype today, and although this try isn't quite right the idea is sound. I'll take this one apart and try again. So happy with this rabbit fabric I bought from a lady on Etsy. Her shop is in China, but it arrived here relatively quickly and much bigger cuts than I expected. 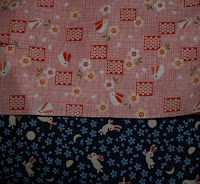 They are both Japanese import fabrics I've seen elsewhere, and will be used in another quilt for Bazooka. Hope you're having a great long weekend!